Portland’s transportation policies are working. At least, they’re working if you think their goal is to increase congestion in order to encourage people to find alternatives to driving. At least, the increased-congestion part is working, but not many are finding alternatives to driving. According to Waze, Portland has the fifth-most-miserable traffic in the United States. Waze is an app that asks its users to rate their driving experiences. Rather than just measure hours of delay, Waze’s driver satisfaction index is based on a variety of indicators including traffic, road quality, safety, driver services, and socio-economic factors such as the impact of gas prices on the cost of living. Waze calculates the index for any area that has more than 20,000 Waze users, which means 246 metropolitan areas in 40 countries. Nationally, the U.S. is ranked number three after the Netherlands and France. In terms of congestion alone, the United States ranks number one (that is, has the least congestion). The Netherlands and France edge out the U.S. in overall scores because of their higher road quality and safety ratings. Unfortunately, Waze’s release of the 2017 index doesn’t include metro area-by-metro area data. But it has posted detailed 2016 data, and the numbers aren’t too different. According to Waze, the nation’s worst congestion was in San Diego (scoring 3.1 on a scale of 1 to 10 with 10 being least congested), followed by New York and San Francisco (3.7 each), then Portland (4.5), Miami (4.8), and Honolulu (4.9). At 5.3, Seattle was supposed to be less congested than Portland, with Chicago (5.4), Boston (5.5), and Washington (5.5) slightly better still and Los Angeles (5.8) even better. None of these come close to Kansas City or Oklahoma City (8.5 each), Phoenix (8.4), Indianapolis (8.2). Among the nation’s largest urban areas, San Antonio is doing well at 7.8; Tampa and Dallas at 7.3; Minneapolis 7.1; Denver 6.9; Atlanta 6.5; and Houston 6.3. Portland’s low ranking is a bit of a surprise considering most other studies agree Los Angeles and Seattle are even more congested. But Portlanders have good reason to believe traffic there is getting worse. As the Portland Tribune noted a few days ago, census data reveal that the number of drivers on the road has greatly increased in the last two years. The Tribune compared 2014 and 2016 data for the city of Portland and the Portland metropolitan area (which is based on county boundaries). The Antiplanner prefers to use the Portland urbanized area as it is more of an economic unit than the other two, which are based on political boundaries. A more detailed look at the data suggests the situation is even worse than reported in the Tribune. First, the Tribune‘s look at 2014 and 2016 data showed an increase in transit commuting along with an increase in auto commuting. But 2015 data show that transit commuting in Portland peaked in that year, and there were 2,210 fewer transit commuters in 2016 than in 2015. That’s the first decline transit has seen since 2010, and the decline that year was due to the financial crisis; no similar excuse exists for 2016. The decline, incidentally, was in bus commuters; the number of rail commuters grew. Second, if we go back a decade, we see that, while transit commuting may have grown in numbers, it hasn’t gained any market share. Transit carried 8.0 percent of Portland-area commuters to work in 2006 just as it did in 2016. People driving alone made up 74.6 percent of commuters in 2006 and the same in 2016. Carpooling’s share declined from 11.2 to 9.8 percent, and the difference was mostly made up for by cycling, which went from 1.2 to 2.8 percent, while walking grew from 3.4 to 3.7 percent. Third, the really big increase was in people who worked at home. The above numbers look only at commuters. 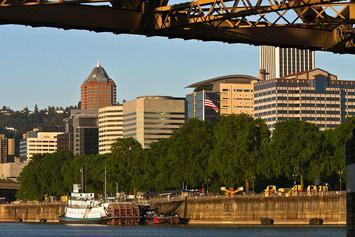 While the total number of Portland-area commuters grew by 19.6 percent, work-at-homes increased by 58.4 percent. While it’s easy to say that work-at-homes are growing faster than transit riders, there’s not much point in doing so as I’m not sure what government policies could promote more working at home if that were considered important. Finally, despite the increase in work at homes, the number of cars used to take people to work has significantly grown. By dividing the number of two-person carpoolers by two, the number of three-person carpoolers by three, etc., we can estimate the total number of cars used by both drive-alones and carpoolers. This grew from about 655,000 in 2006 to 764,000 in 2016. Adding more than 100,000 new cars to the road in a decade must have increased congestion, especially since Portland hasn’t built many, if any, new freeways and other arterials in that time period. Yet that congestion hasn’t led a greater share of commuters to ride transit. In fact, transit’s share shrank from 8.5 percent in 2015 to 8.0 percent in 2016 even though there were 4.3 percent more cars commuting to work in 2016 than in 2015. Census data also estimate the total amount of time people spend getting to or from work (table B08136). Dividing by the number of commuters reveals average trip times. Between 2006 and 2016, average trip times for auto commuters grew from 22.5 to 25.7 minutes, which indicates that congestion has increased. Average trip times for transit commuters grew from 42.0 to 45.1 minutes. Transit is slower, but longer trip times also suggest that people are willing to spend more time commuting if they don’t have to drive themselves. Curiously, bus trip times in 2016 were shorter than rail whereas they were longer in 2006. This could mean buses are faster but more likely means people have grown less tolerant of sitting on buses when alternatives, such as rail or Uber, are available. In short, Portland is definitely more congested, but nothing else has worked as planners hoped. Congestion has not boosted transit’s share or discouraged drive-alone’s share of commuting. All of the money spent on light rail has gotten people off of buses and onto trains, but hasn’t gotten people out of their cars and onto transit. All that has happened is that costs to everyone have grown.